For other people named Henry Moore, see Henry Moore (disambiguation). Henry Spencer Moore OM CH FBA (30 July 1898 – 31 August 1986) was an English artist. He is best known for his semi-abstract monumental bronze sculptures which are located around the world as public works of art. As well as sculpture, Moore produced many drawings, including a series depicting Londoners sheltering from the Blitz during the Second World War, along with other graphic works on paper. Henry Moore was born in Castleford, West Riding of Yorkshire, England, to Mary Baker and Raymond Spencer Moore. His father was of Irish origin and became pit deputy and then under-manager of the Wheldale colliery in Castleford. He was an autodidact with an interest in music and literature. Determined that his sons would not work in the mines, he saw formal education as the route to their advancement. Henry was the seventh of eight children in a family that often struggled with poverty. He attended infant and elementary schools in Castleford, where he began modelling in clay and carving in wood. He professed to have decided to become a sculptor when he was eleven after hearing of Michelangelo's achievements at a Sunday School reading. On his second attempt he was accepted at Castleford Grammar School, which several of his siblings had attended, where his headmaster soon noticed his talent and interest in medieval sculpture. His art teacher broadened his knowledge of art, and with her encouragement, he determined to make art his career; first by sitting for examinations for a scholarship to the local art college. Moore's earliest recorded carvings – a plaque for the Scott Society at Castleford Secondary School, and a Roll of Honour commemorating the boys who went to fight in the First World War from the school – were executed around this time. Despite his early promise, Moore's parents had been against him training as a sculptor, a vocation they considered manual labour with few career prospects. After a brief introduction as a student teacher, Moore became a teacher at the school he had attended. Upon turning eighteen, Moore volunteered for army service. He was the youngest man in the Prince of Wales' Own Civil Service Rifles regiment and was injured in 1917 in a gas attack, on 30 November at Bourlon Wood, during the Battle of Cambrai. After recovering in hospital, he saw out the remainder of the war as a physical training instructor, only returning to France as the Armistice was signed. He recalled later, "for me the war passed in a romantic haze of trying to be a hero." This attitude changed as he reflected on the destructiveness of war and in 1940 he wrote, in a letter to his friend Arthur Sale, that "a year or two after [the war] the sight of a khaki uniform began to mean everything in life that was wrong and wasteful and anti-life. And I still have that feeling." Moore's reclining figures, such as the 1930 Reclining Woman (bottom), were influenced by Chac Mool figures, such as this one (top) from Chichen Itza. After the Great War, Moore received an ex-serviceman's grant to continue his education and in 1919 he became a student at the Leeds School of Art (now Leeds College of Art), which set up a sculpture studio especially for him. At the college, he met Barbara Hepworth, a fellow student who would also become a well-known British sculptor, and began a friendship and gentle professional rivalry that lasted for many years. In Leeds, Moore also had access to the modernist works in the collection of Sir Michael Sadler, the University Vice-Chancellor, which had a pronounced effect on his development. In 1921, Moore won a scholarship to study at the Royal College of Art in London, along with Hepworth and other Yorkshire contemporaries. While in London, Moore extended his knowledge of primitive art and sculpture, studying the ethnographic collections at the Victoria and Albert Museum and the British Museum. The student sculptures of both Moore and Hepworth followed the standard romantic Victorian style, and included natural forms, landscapes and figurative modelling of animals. Moore later became uncomfortable with classically derived ideals; his later familiarity with primitivism and the influence of sculptors such as Constantin Brâncuși, Jacob Epstein, Henri Gaudier-Brzeska and Frank Dobson led him to the method of direct carving, in which imperfections in the material and marks left by tools became part of the finished sculpture. Having adopted this technique, Moore was in conflict with academic tutors who did not appreciate such a modern approach. During one exercise set by Derwent Wood (the professor of sculpture at the Royal College), Moore was asked to reproduce a marble relief of Domenico Rosselli's The Virgin and Child by first modelling the relief in plaster, then reproducing it in marble using the mechanical aid known as a "pointing machine", a technique called "pointing". Instead, he carved the relief directly, even marking the surface to simulate the prick marks that would have been left by the pointing machine. In 1924, Moore won a six-month travelling scholarship which he spent in Northern Italy studying the great works of Michelangelo, Giotto di Bondone, Giovanni Pisano and several other Old Masters. During this period he also visited Paris, took advantage of the timed-sketching classes at the Académie Colarossi, and viewed, in the Trocadero, a plaster cast of a Toltec-Maya sculptural form, the Chac Mool, which he had previously seen in book illustrations. The reclining figure was to have a profound effect upon Moore's work, becoming the primary motif of his sculpture. On returning to London, Moore undertook a seven-year teaching post at the Royal College of Art. He was required to work two days a week, which allowed him time to spend on his own work. His first public commission, West Wind (1928–29), was one of the eight reliefs of the 'four winds' high on the walls of London Underground's headquarters at 55 Broadway. The other 'winds' were carved by contemporary sculptors including Eric Gill with the ground-level pieces provided by Epstein. 1928 saw Moore's first solo exhibition, held at the Warren Gallery in London. In July 1929, Moore married Irina Radetsky, a painting student at the Royal College. Irina was born in Kiev in 1907 to Ukrainian–Polish parents. Her father did not return from the Russian Revolution and her mother was evacuated to Paris where she married a British army officer. Irina was smuggled to Paris a year later and went to school there until she was 16, after which she was sent to live with her stepfather's relatives in Buckinghamshire. West Wind, 1928–29; Moore's first public commission was carved from Portland stone and shows the influence of Michelangelo's figures for the Medici Chapel and the Chac Mool figure. Irina found security in her marriage to Moore and was soon posing for him. Shortly after they married, the couple moved to a studio in Hampstead at 11a Parkhill Road NW3, joining a small colony of avant-garde artists who were taking root there. Shortly afterward, Hepworth and her second husband Ben Nicholson moved into a studio around the corner from Moore, while Naum Gabo, Roland Penrose, Cecil Stephenson and the art critic Herbert Read also lived in the area (Read referred to the area as "a nest of gentle artists"). This led to a rapid cross-fertilization of ideas that Read would publicise, helping to raise Moore's public profile. The area was also a stopping-off point for many refugee artists, architects and designers from continental Europe en route to America—some of whom would later commission works from Moore. In 1932, after six year's teaching at the Royal College, Moore took up a post as the Head of the Department of Sculpture at the Chelsea School of Art. Artistically, Moore, Hepworth and other members of The Seven and Five Society would develop steadily more abstract work, partly influenced by their frequent trips to Paris and their contact with leading progressive artists, notably Pablo Picasso, Georges Braque, Jean Arp and Alberto Giacometti. Moore flirted with Surrealism, joining Paul Nash's modern art movement "Unit One", in 1933. In 1934, Moore visited Spain; he visited the cave of Altamira (which he described as the "Royal Academy of Cave Painting"), Madrid, Toledo and Pamplona. Moore and Nash were on the organising committee of the International Surrealist Exhibition, which took place in London in 1936. In 1937, Roland Penrose purchased an abstract 'Mother and Child' in stone from Moore that he displayed in the front garden of his house in Hampstead. The work proved controversial with other residents and the local press ran a campaign against the piece over the next two years. At this time Moore gradually transitioned from direct carving to casting in bronze, modelling preliminary maquettes in clay or plaster rather than making preparatory drawings. In 1938, Moore met Kenneth Clark for the first time. From this time, Clark became an unlikely but influential champion of Moore's work, and through his position as member of the Arts Council of Great Britain he secured exhibitions and commissions for the artist. At the outbreak of the Second World War the Chelsea School of Art was evacuated to Northampton and Moore resigned his teaching post. During the war, Moore produced powerful drawings of Londoners sleeping in the London Underground while sheltering from the Blitz. Kenneth Clark, the chairman of the War Artists' Advisory Committee (WAAC), had previously tried to recruit Moore as a full-time salaried war artist and now agreed to purchase some of the shelter drawings and issued contracts for further examples. The shelter drawings WAAC acquired were completed between the autumn of 1940 and the spring of 1941 and are regarded as among the finest products of the WAAC scheme. In August 1941 WAAC commissioned Moore to draw miners working underground at the Wheldale Colliery in Yorkshire, where his father had worked at the start of the century. Moore drew the people in the shelters as passively waiting the all-clear while miners aggressively worked the coal-faces. These drawings helped to boost Moore's international reputation, particularly in America where examples were included in the WAAC Britain at War exhibition which toured North America throughout the war. After their Hampstead home was hit by bomb shrapnel in September 1940, Moore and Irina moved out of London to live in a farmhouse called Hoglands in the hamlet of Perry Green near Much Hadham, Hertfordshire. This was to become Moore's home and workshop for the rest of his life. Despite acquiring significant wealth later in life, Moore never felt the need to move to larger premises and, apart from the addition of a number of outbuildings and studios, the house changed little over the years. In 1943 he received a commission from St Matthew's Church, Northampton, to carve a Madonna and Child; this sculpture was the first in an important series of family-group sculptures. 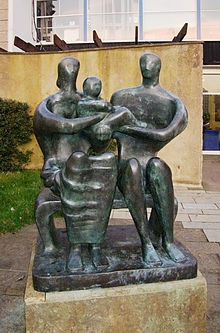 Family Group (1950) bronze, Barclay School, Stevenage, Hertfordshire. Moore's first large-scale commission after World War II. Shahbanu Farah in Henry Moore's Gallery, Tehran, May 1971. After the war and following several earlier miscarriages, Irina gave birth to their daughter, Mary Moore, in March 1946. The child was named after Moore's mother, who had died two years earlier. Both the loss of his mother and the arrival of a baby focused Moore's mind on the family, which he expressed in his work by producing many "mother-and-child" compositions, although reclining and internal/external figures also remained popular. In the same year, Moore made his first visit to America when a retrospective exhibition of his work opened at the Museum of Modern Art in New York City. Before the war, Moore had been approached by educator Henry Morris, who was trying to reform education with his concept of the Village College. Morris had engaged Walter Gropius as the architect for his second village college at Impington near Cambridge, and he wanted Moore to design a major public sculpture for the site. The County Council, however, could not afford Gropius's full design, and scaled back the project when Gropius emigrated to America. Lacking funds, Morris had to cancel Moore's sculpture, which had not progressed beyond the maquette stage. Moore was able to reuse the design in 1950 for a similar commission outside a secondary school for the new town of Stevenage. This time, the project was completed and Family Group became Moore's first large-scale public bronze. In the 1950s, Moore began to receive increasingly significant commissions. He exhibited Reclining Figure: Festival at the Festival of Britain in 1951, and in 1958 produced a large marble reclining figure for the UNESCO building in Paris. With many more public works of art, the scale of Moore's sculptures grew significantly and he started to employ an increasing number of assistants to work with him at Much Hadham, including Anthony Caro and Richard Wentworth. On the campus of the University of Chicago in December 1967, 25 years to the minute after the team of physicists led by Enrico Fermi achieved the first controlled, self-sustaining nuclear chain reaction, Moore's Nuclear Energy was unveiled on the site of what was once the university's football field stands, in the rackets court beneath which the experiments had taken place. This 12-foot-tall piece in the middle of a large, open plaza is often thought to represent a mushroom cloud topped by a massive human skull, but Moore's interpretation was very different. He once told a friend that he hoped viewers would "go around it, looking out through the open spaces, and that they may have a feeling of being in a cathedral." In Chicago, Illinois, Moore also commemorated science with a large bronze sundial, locally named Man Enters the Cosmos (1980), which was commissioned to recognise the space exploration program. The last three decades of Moore's life continued in a similar vein; several major retrospectives took place around the world, notably a very prominent exhibition in the summer of 1972 in the grounds of the Forte di Belvedere overlooking Florence. Following the pioneering documentary 'Henry Moore', produced by John Read in 1951, he appeared in many films. In 1964, for instance, Moore was featured in the documentary "5 British Sculptors (Work and Talk)" by American filmmaker Warren Forma. By the end of the 1970s, there were some 40 exhibitions a year featuring his work. The number of commissions continued to increase; he completed Knife Edge Two Piece in 1962 for College Green near the Houses of Parliament in London. According to Moore, "When I was offered the site near the House of Lords ... I liked the place so much that I didn't bother to go and see an alternative site in Hyde Park—one lonely sculpture can be lost in a large park. The House of Lords site is quite different. It is next to a path where people walk and it has a few seats where they can sit and contemplate it." As his wealth grew, Moore began to worry about his legacy. With the help of his daughter Mary, he set up the Henry Moore Trust in 1972, with a view to protecting his estate from death duties. By 1977, he was paying close to a million pounds a year in income tax; to mitigate his tax burden, he established the Henry Moore Foundation as a registered charity with Irina and Mary as trustees. The Foundation was established to encourage the public appreciation of the visual arts and especially the works of Moore. It now runs his house and estate at Perry Green, with a gallery, sculpture park and studios. Moore died on 31 August 1986 (at the age of 88) at his home in Perry Green, near Much Hadham, Hertfordshire. His body was interred at the churchyard of St. Thomas's Church. Moore's signature form is a reclining figure. Moore's exploration of this form, under the influence of the Toltec-Mayan figure he had seen at the Louvre, was to lead him to increasing abstraction as he turned his thoughts towards experimentation with the elements of design. Moore's earlier reclining figures deal principally with mass, while his later ones contrast the solid elements of the sculpture with the space, not only round them but generally through them as he pierced the forms with openings. Moore's early work is focused on direct carving, in which the form of the sculpture evolves as the artist repeatedly whittles away at the block. In the 1930s, Moore's transition into modernism paralleled that of Barbara Hepworth; the two exchanged new ideas with each other and several other artists then living in Hampstead. Moore made many preparatory sketches and drawings for each sculpture. Most of these sketchbooks have survived and provide insight into Moore's development. He placed great importance on drawing; in old age, when he had arthritis, he continued to draw. After the Second World War, Moore's bronzes took on their larger scale, which was particularly suited for public art commissions. As a matter of practicality, he largely abandoned direct carving, and took on several assistants to help produce the larger forms based on maquettes. By the end of the 1940s, he produced sculptures increasingly by modelling, working out the shape in clay or plaster before casting the final work in bronze using the lost wax technique. These maquettes often began as small forms shaped by Moore's hands—a process which gives his work an organic feeling. They are from the body. At his home in Much Hadham, Moore built up a collection of natural objects; skulls, driftwood, pebbles, rocks and shells, which he would use to provide inspiration for organic forms. For his largest works, he usually produced a half-scale, working model before scaling up for the final moulding and casting at a bronze foundry. Moore often refined the final full plaster shape and added surface marks before casting. Moore produced at least three significant examples of architectural sculpture during his career. In 1928, despite his own self-described "extreme reservations", he accepted his first public commission for West Wind for the London Underground Building at 55 Broadway in London, joining the company of Jacob Epstein and Eric Gill. In 1953, he completed a four-part concrete screen for the Time-Life Building in New Bond Street, London, and in 1955 Moore turned to his first and only work in carved brick, "Wall Relief" at the Bouwcentrum in Rotterdam. The brick relief was sculpted with 16,000 bricks by two Dutch bricklayers under Moore's supervision. The aftermath of World War II, The Holocaust, and the age of the atomic bomb instilled in the sculpture of the mid-1940s a sense that art should return to its pre-cultural and pre-rational origins. In the literature of the day, writers such as Jean-Paul Sartre advocated a similar reductive philosophy. At an introductory speech in New York City for an exhibition of one of the finest modernist sculptors, Alberto Giacometti, Sartre spoke of "The beginning and the end of history". Moore's sense of England emerging undefeated from siege led to his focus on pieces characterised by endurance and continuity. Most sculptors who emerged during the height of Moore's fame, and in the aftermath of his death, found themselves cast in his shadow. By the late 1940s, Moore was a worldwide celebrity; he was the voice of British sculpture, and of British modernism in general. The next generation was constantly compared against him, and reacted by challenging his legacy, his "establishment" credentials and his position. At the 1952 Venice Biennale, eight new British sculptors produced their Geometry of Fear works as a direct contrast to the ideals behind Moore's idea of Endurance, Continuity; his large bronze Double Standing Figure stood outside the British pavilion, and contrasted strongly with the rougher and more angular works inside. Yet Moore had a direct influence on several generations of sculptors of both British and international reputation. Among the artists who have acknowledged Moore's importance to their work are Sir Anthony Caro, Phillip King and Isaac Witkin, all three having been assistants to Moore. Other artists whose work was influenced by him include Helaine Blumenfeld, Drago Marin Cherina, Lynn Chadwick, Eduardo Paolozzi, Bernard Meadows, Reg Butler, William Turnbull, Robert Adams, Kenneth Armitage, and Geoffrey Clarke. In December 2005, the two ton Reclining Figure (1969–70) – insured for £3 million – was lifted by crane from the grounds of the Henry Moore Foundation on to a lorry and has not been recovered. Two men were jailed for a year in 2012 for stealing a sculpture called Sundial (1965) and the bronze plinth of another work, also from the foundation's estate. In October 2013 Standing Figure (1950), one of four Moore pieces in Glenkiln Sculpture Park, estimated to be worth £3 million, was stolen. In 2012, the council of the London Borough of Tower Hamlets announced its plans to sell another version of Draped Seated Woman 1957–58, a 1.6-tonne bronze sculpture. Moore, a well-known socialist, had sold the sculpture at a fraction of its market value to the former London County Council on the understanding that it would be displayed in a public space and might enrich the lives of those living in a socially deprived area. Nicknamed Old Flo, it was installed on the Stifford council estate in 1962 but was vandalised and moved to the Yorkshire Sculpture Park in 1997. Tower Hamlets Council later had considered moving Draped Seated Woman to private land in Canary Wharf but instead chose to "explore options" for a sale. In response to the announcement an open letter was published in The Guardian, signed by Mary Moore, the artist's daughter, by Sir Nicholas Serota, Director of the Tate Gallery, by filmmaker Danny Boyle, and by artists including Jeremy Deller. The letter said that the sale "goes against the spirit of Henry Moore's original sale" of the work. Today, the Henry Moore Foundation manages the artist's former home at Perry Green in Hertfordshire as a visitor destination, with 70 acres of sculpture grounds as well as his restored house and studios. It also runs the Henry Moore Institute in Leeds which organises exhibitions and research activities in international sculpture. Popular interest in Moore's work was perceived by some to have declined for a while in the UK but has been revived in recent times by exhibitions including Henry Moore at Tate Britain in 2010 and Moore at Kew and Hatfield in 2007 and 2011 respectively. The Foundation he endowed continues to play an essential role in promoting contemporary art in the United Kingdom and abroad through its grants and exhibitions programme. Three Way Piece No. 2 (The Archer), (1964–65) has been on display in front of Toronto City Hall in Nathan Phillips Square since 1966. The world's largest collection of Moore's work is open to the public and is housed in the house and grounds of the 60-acre estate, that was Moore's home for forty years, in Perry Green, Hertfordshire. The site and the collection are now owned by the Henry Moore Foundation. In December 2005, thieves entered a courtyard at the Henry Moore Foundation and stole a cast of Moore's Reclining Figure 1969-70 (LH 608) – a 3.6 metre-long, 2.1-tonne bronze sculpture. Closed-circuit-television footage showed that they used a crane to lower the piece onto a stolen flatbed truck. A substantial reward was offered by the Foundation for information leading to its recovery. By May 2009, after a thorough investigation, British officials said they believe the work, once valued at £3 million (US$5.3 million), was probably sold for scrap metal, fetching about £5,000. In July 2012 the 22 inches (56 cm) bronze Sundial 1965, valued at £500,000, was stolen from the Moore Foundation. Later that year, following the details of the theft being publicised on the BBC Crimewatch television programme, the work was recovered, and the thieves were sentenced to twelve months' custody. Moore presented 36 sculptures, as well as drawings, maquettes and other works to the Tate Gallery in 1978. The Henry Moore Sculpture Centre in the Art Gallery of Ontario, Toronto, opened in 1974. It comprises the world's largest public collection of Moore's work, most of it donated by him between 1971 and 1974. Moore's Three Way Piece No. 2 (The Archer) has also been on display in Nathan Phillips Square at Toronto City Hall since 1966. In 1948, Moore won the International Sculpture Prize at the Venice Biennale. He turned down a knighthood in 1951 because he felt that the bestowal would lead to a perception of him as an establishment figure and that "such a title might tend to cut me off from fellow artists whose work has aims similar to mine". He was, however, awarded the Companion of Honour in 1955, the Order of Merit in 1963 and Erasmus Prize in 1968. He was a trustee of both the National Gallery and Tate Gallery. His proposal that a wing of the latter should be devoted to his sculptures aroused hostility among some artists. In 1975, he became the first President of the Turner Society, which had been founded to campaign for a separate museum in which the whole Turner Bequest might be reunited, an aim defeated by the National Gallery and Tate Gallery. Given to the City of London by Moore and the Contemporary Art Society in 1967, Knife Edge Two Piece 1962–65 is displayed in Abingdon Street Gardens, opposite the Houses of Parliament, where its regular appearance in the background of televised news reports from Westminster makes it Moore's most prominent piece in Britain. The ownership of Knife Edge Two Piece 1962–65 was disputed until its 2011 acquisition by the Parliamentary Art Collection. By the end of his career, Moore was the world's most successful living artist at auction. In 1982, four years before his death, Sotheby's in New York sold a 6 ft Reclining Figure (1945), for $1.2 million to collector Wendell Cherry. Although a first record of $4.1 million was set in 1990, Moore's market slumped during the recession that followed. In 2012, his eight-foot bronze, Reclining Figure: Festival (1951) sold for a record £19.1 million at Christie's, making him the second most expensive 20th-century British artist after Francis Bacon. Knife Edge Two Piece, Queen Elizabeth Park, Vancouver, B.C., Canada. 1970. Large Upright Internal/External Form, (1982), Kew Gardens, London, exhibition of 28 pieces, 2007. ^ "1898–1925: Childhood and Education". Henry Moore Foundation. Retrieved 24 January 2017. ^ Wilkinson, Alan G. (2002). Henry Moore: Writings and Conversations. University of California Press. p. 41. ISBN 0-520-23161-9. ^ "Letter to Arthur Sale, 30 April 1940". Imperial War Museum. Retrieved 5 May 2017. ^ "Henry Moore: Life and Work". Museum of Modern Art. Archived from the original on 2 February 2009. Retrieved 28 February 2017. ^ Allemand-Cosneau, Claude; Fath, Manfred; Mitchinson, David (1996). Henry Moore. Nantes: Musée des Beaux Arts. p. 63. ISBN 3-7913-1662-1. ^ "Henry Moore: Biography 1916–1925". Henry Moore Foundation. Archived from the original on 1 February 2009. Retrieved 24 September 2008. ^ Cork, Richard (1985). Art Beyond the Gallery in Early 20th Century England: In Early 20th Century England. Yale University Press. p. 249. ISBN 0-300-03236-6. ^ "Henry Moore: Sculptor". Modernism 101. Archived from the original on 10 December 2008. Retrieved 22 September 2008. ^ "The Seven and Five Society". Tate. Archived from the original on 26 July 2014. Retrieved 4 September 2008. ^ Rojas, Laurie (30 October 2013). "Henry Moore Revisits Spain". The Art Newspaper. Archived from the original on 3 November 2013. ^ Beckett et al., 6. ^ "Insight at end of the Tunnel". Tate. Archived from the original on 9 April 2009. Retrieved 16 August 2008. ^ a b Brain Foss (2007). War paint: Art, War, State and Identity in Britain, 1939–1945. Yale University Press. ISBN 978-0-300-10890-3. ^ "Henry Moore". Guggenheim Collection. Retrieved 28 February 2017. ^ Beckett et al., 96. ^ "Moore, Henry". UNESCO. Retrieved on 16 August 2008. ^ Anthony Caro. Tate exhibition catalogue, 2005. Retrieved on 20 September 2008. ^ Wentworth. tate.org.uk. Retrieved on 20 September 2008. ^ 3:36 p.m., 2 December 1967. In: McNally, Rand. "Illinois; Guide & Gazetteer". Illinois Sesquicentennial Commission. University of Virginia, 1969. 199. ^ Beckett et al., 221. ^ Enscripted on the plaque at the base of the sculpture. ^ Chamot, Mary; Farr, Dennis; Butlin, Martin. "Henry Moore Archived 31 January 2009 at the Wayback Machine". "The Modern British Paintings, drawings and Sculpture", Volume II. London: Oldbourne Press, 1964. 481. Retrieved on 5 September 2008. ^ Kennedy, Maev. "A hush falls over Henry Moore country". The Guardian, 22 April 1999. Retrieved on 24 September 2008. ^ "GHDI - Image". ghi-dc.org. ^ "The Hole of Life". Tate Magazine, Issue 5, Autumn 2005. Retrieved on 6 September 2008. ^ Day, Elizabeth. "The Moore legacy". The Observer, 27 July 2008. Retrieved on 4 September 2008. ^ Lawrence Sabbath (5 October 1985). Show chance to view "20th-century Michelangelo" (interview with Ann Garrould). The Montreal Gazette. Accessed September 2013. ^ a b Causey, 34. ^ Ann Jones (2007). Geometry of Fear: Works from the Arts Council Collection Archived 30 June 2015 at the Wayback Machine (exhibition leaflet). London: Southbank Centre. Accessed 6 May 2017. ^ Caro biography Archived 1 February 2016 at the Wayback Machine. anthonycaro.org. Retrieved on 4 September 2008. ^ "Phillip King Archived 31 May 2008 at the Wayback Machine". sculpture.org.uk. Retrieved on 6 September 2008. ^ "Isaac Witkin". The Times, 10 May 2006. Retrieved on 29 August 2008. ^ a b "The Bronze Age". Tate Magazine, Issue 6, 2008. Retrieved 23 August 2008. ^ David Wilcock (13 July 2012), Henry Moore sundial stolen from former garden The Independent. ^ a b Bronze Henry Moore work stolen from sculpture park Evening Standard, 13 October 2013. ^ "Missing Henry Moore bronze statue 'worth £3m'". bbc.co.uk. 13 October 2013. Retrieved 15 October 2013. ^ Carol Vogel (5 November 2012), British Art World Figures Protest Possible Sale of a Henry Moore New York Times. 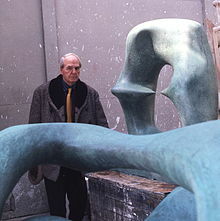 ^ Ian Youngs (5 October 2012), Council to sell Henry Moore sculpture BBC News. ^ Dalya Alberge (3 November 2012), Britain's cultural elite battles to halt sale of Henry Moore sculpture The Guardian. ^ "Unfinished Business: Mark Wilsher on view from 26 July Archived 6 October 2008 at the Wayback Machine". Henry Moore Foundation, 2008. Retrieved on 22 September 2008. ^ Bowcott, Owen (19 December 2005). "Lorry used to steal £3m Moore sculpture found on housing estate". The Guardian. Retrieved 9 June 2009. ^ "£3m Henry Moore sculpture stolen". BBC News Online. 17 December 2005. Retrieved 9 June 2009. ^ "Henry Moore sundial sculpture stolen from museum garden". the Guardian. ^ "Henry Moore sundial theft pair jailed". BBC News Online. 4 December 2012. Retrieved 3 May 2013. ^ "The Archer - sculpture - Nathan Phillips Square". toronto.ca. Archived from the original on 12 October 2014. ^ "Henry Moore Archived 31 January 2009 at the Wayback Machine". Visual Arts Department, British Council. Retrieved on 5 September 2008. ^ Chamot, Mary; Farr, Dennis; Butlin, Martin . "Henry Moore OM, CH ". From The Modern British Paintings, Drawings and Sculpture, London 1964, II. Reproduced at Tate.org. Retrieved on 21 August 2008. ^ "J.M.W. Turner". Turner Society. Retrieved on 16 August 2008. ^ "Turner Collection". Tate Gallery. Retrieved on 9 August 2008. ^ "Conservation of Henry Moore sculpture to begin". London. 11 February 2013. ^ Colin Gleadell (13 February 2012), Modern sales review: when Moore means more The Daily Telegraph. Beckett, Jane; Russell, Fiona (2003). Henry Moore: Space, Sculpture, Politics. Burlington, Vermont: Ashgate. ISBN 0-7546-0836-0. Berthoud, Roger (2003). The Life of Henry Moore (2 ed.). Giles de la Mare. ISBN 978-1900357227. Causey, Andrew (1998). Sculpture Since 1945. Oxford: Oxford University Press. ISBN 0-19-284205-6. Grohmann, Will (1960). The Art of Henry Moore. New York: H. N. Abrams. Darracott, J. (1975). Henry Moore War Drawings. Feldman, Anita (2009). Henry Moore Textiles. Surrey: Lund Humphries. ISBN 978-1-84822-052-2. Feldman, Anita (2013). Henry Moore: Large Late Forms. London: Gagosian. Feldman, Anita (2014). Body & Void: Echoes of Moore in Contemporary Art. Perry Green: The Henry Moore Foundation. ISBN 978-0-906909-32-4. Feldman, Anita; Pinet, Hélène; Moore, Mary; Blanchetière, François (2013). Moore Rodin. Perry Green: The Henry Moore Foundation. ISBN 978-0-906909-31-7. Feldman, Anita; Woodward, Malcolm (2011). Henry Moore Plasters. London: Royal Academy of Arts. ISBN 978-1-907533-11-2. Hedgecoe, John. A Monumental Vision: The Sculpture of Henry Moore. Collins & Brown. ISBN 1-55670-683-9. Kosinski, Dorothy, ed. (2001). Henry Moore: Sculpting the 20th Century. New Haven: Yale University Press. Mitchinson, David; Feldman Bennet, Anita (2002). Moore: The Graphics. ISBN 0-906909-26-0. Moore, Henry (1986). Henry Moore: Model to Monument. New York: Kent Fine Art. ISBN 1-878-60721-9. O'Reilly, Sally; Oliver, Clare. Henry Moore. Scholastic Library. ISBN 0-531-16643-0. Seldis, Henry J. Henry Moore in America. Praeger. Sylvester, David (1968). Henry Moore. London: Arts Council of Great Britain. Henry Moore: At Dulwich Picture Gallery. Scala. 2004. ISBN 1-85759-352-9. Henry Moore collection at the Israel Museum. Retrieved September 2016.